Suite Sports: Should the Re-Tooled Bulls Give it All Up for Love? Should the Re-Tooled Bulls Give it All Up for Love? 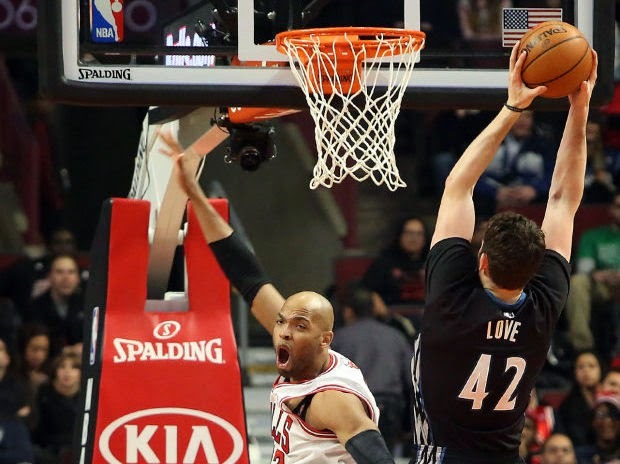 Defensive ace Taj Gibson may have to step aside if the Bulls are serious about acquiring Kevin Love. Despite unloading Luol Deng early in the 2013-14 season and the absence of Derrick Rose for a second consecutive year, the Bulls compiled a 36-16 record after January 1st, one of the best marks in the league. Tom Thibodeau once again engineered one of the best defenses in the NBA, second in defensive efficiency only to Indiana. Anchored by Defensive Player of the Year Joakim Noah, Chicago powered into the playoffs as a gritty contender in a weak Eastern Conference, so feared that the Brooklyn Nets tanked out of the fifth seed to face the Raptors instead. While the regular season was a feel-good story for Chicago, the Bulls were manhandled by the Wizards in the playoffs and sent packing in just five games. The Bulls were unable to lean on the stout defense that had propped them up all season, and the sharpshooting ‘Zards proved too much to handle. Washington shot 38.3% from downtown against the Bulls, who had held opponents to 35.1% during the regular season. The marksmanship of Trevor Ariza and Bradley Beal combined with Nene, who created a glaring hole in the defense by connecting on 20 of his 39 mid-range attempts, stretched the normally stingy Bulls defense thin. By forcing Chicago defenders to leak towards him, Nene helped spread the floor for Washington’s deadly shooters and provided more space for John Wall to make plays. The slow, painful offensive possessions for Chicago were only magnified in the playoffs, as the Bulls struggled without a true playmaker. In their courageous fight to the playoffs, Thibodeau operated an eight-man rotation for the majority of the season (8.5 if you include the seven minutes per game registered by Nazr Mohammed), with one member (Boozer) glued to the bench for the fourth quarter. Just like last season, when facing plantar fasciitis, Noah valiantly fought through a knee injury during the Washington series. But, by the time they faced the Wizards, the Bulls were simply too fatigued. The Deng trade forced Tony Snell into the rotation perhaps a little too early, as Thibs typically likes to let his younger players develop and learn the defensive system before awarding them playing time (see: Jimmy Butler). D.J. Augustin was picked up off the scrap heap in December when he was waived by the Raptors, and served as a major contributor, leading the team in points per game as a spark plug off the bench. In a sense, this team was dealt two devastating losses in Rose and Deng, and was therefore constructed on the fly as Thibodeau worked his defensive magic to ignite them into the postseason. In an active free agency, Chicago has clearly emerged as one of the biggest winners outside the state of Ohio. The Bulls finally pulled the plug on Carlos Boozer, amnestying the final year of his contract, and made quick use of the cap space provided. By nabbing Pau Gasol, and outbidding fellow contenders in the process, Chicago acquired a veteran who can bolster their anemic offense. Gasol never quite fit the D’Antoni system, but is still an efficient pick-and-roll man (1.11 Pointer Per Possession as the roll man, per Synergy) and is crafty away from the ball with his ability to make cuts. While not the best defender, he is more agile than Boozer and can serve as an active passer from the high post. In addition, the Bulls signed 2011 first rounder Nikola Mirotic, who shot 46.1% from deep in the Euroleague with Real Madrid. Combined with the passing of Noah and post-up threat Taj Gibson, Chicago has perhaps the most dynamic frontcourt in the league, with plenty of feasible combinations for Thibs to juggle with while still preserving the team’s defensive identity. Add Aaron Brooks to replace last year’s hero D.J. Augustin, and the Bulls look to have solidified their depth (Brooks seems destined to have a good year like the small Chicago point guards before him). The Bulls surrendered a lot to nab Doug McDermott, and Snell’s stroke looked markedly improved during the NBA Summer League. This is another key piece for Chicago – the Bulls took just 17.8 three pointers a game last season (28th in the NBA), and made just 34.8% of them (24th in the NBA). If Snell proves he’s ready to handle more minutes, iron man Jimmy Butler can finally get a breather, and maybe this will solve his plummet in three-point shooting last season. All this factors into the rumors connecting Chicago to the Kevin Love race, and whether Chicago should sacrifice some of the depth it has accumulated. Perhaps unfairly, Love has received harsh criticism for not yet making the playoffs in his career, despite having to play through the David Kahn era. There is no question that Love is a truly unique talent, combining the ability to knock down three pointers (37.6% on 6.6 attempts per game) while maintaining a presence on the boards (12.5 per game). Love also developed into more of a playmaker last season, averaging a career-high in assists (4.4 per game). His defensive shortcomings are well documented, but we’re still talking about a top ten player in the NBA. For a team with one of the best defenses in the league, maybe adding a liability wouldn’t be such a problem, as the presence of Noah could hide some of Love’s lapses. And for a team with one of the worst offenses in the league, adding a player of Love’s caliber could completely change the team’s dynamic. Perhaps with defenses more tuned in on Love, other players will get better looks, and the Bulls will develop into a better team from distance as a whole. Pairing Rose (assuming he is finally healthy) with Love could prove to be deadly. I can see it now – a Rose-Noah pick-and-roll at the top of the key, followed by a Rose drive-and-kick to Love in the corner. This big three would be one of the most lethal in the NBA, equipped with a lockdown defender, an elite stretch-four, and a playmaking point guard. Unlike Miami’s first year when Wade and LeBron had to take turns on offense before truly learning how to coexist, there isn’t nearly as much overlap in terms of skill set in this trio. If they can stay healthy and retain enough role players after the trade, the Bulls could be serious title contenders sitting comfortably in a tier of their own in the East. At the same time though, acquiring Love would break up the depth the team just worked so hard to obtain. Gibson would be dealt in most Love proposals, and in that the Bulls would lose a key defender to pair with Noah in crunch time minutes. Taj elevated his game last year, and embodied the role of a prototypical Thibodeau player by staying active and playing with palpable intensity. He’s a pest defensively (100 Defensive Rating), and a huge part of the reason why Chicago’s defense was so effective. One proposal also includes Mirotic and McDermott, the two potent shooters Chicago coveted during the offseason. A wing like Dougie McBuckets also might be easier to hide than a power forward like Love, given the current depth at the four in the NBA. With a quartet of Noah, Gasol, Gibson and Mirotic, the Bulls can mix and match a dynamic skill set to fit the style of their opponent. Many of the same sets that the Bulls would run to get Love open threes can be run for Mirotic, so the presence of a stretch-four still exists. Rose’s insertion back in the lineup cannot be overstated, as his presence last season would have put the Bulls firmly in the mix for the top seed, especially with Indiana’s catastrophic meltdown and Dwyane Wade skipping every other game for the Heat. Defensively, when Noah needs a breather, I’m not sold that a Love-Gasol pairing would be able to hold up in the playoffs against a powerful frontline like the Wizards. Without Love, I think the currently constructed Bulls can be penciled in as the favorites in a suddenly balanced Eastern Conference. A team that ran out of gas last season is now equipped with two markedly better forwards than Boozer, a shooter in McDermott, the development of guys like Snell and Butler, and above all else, the return of Rose. It’s difficult to determine whether a Love deal is beneficial based solely on the rumor mill, but losing too many pieces could send Chicago down the same path that resulted in the demise of the 2014 Bulls. Conversely, Love might put them over the top, especially because it prevents Cleveland from pairing him with LeBron. Then again, with so many rumors circulating through NBA circles this time of year, perhaps the Bulls are providing a smokescreen to force the Cavs to up their offer. Chicago is at an interesting crossroads, with both paths seemingly pointed in the right direction. Now it is a matter of whether they will gamble on a superstar, or maintain the depth and continuity that they lacked so much of last season. I want to emphasize that this trade isn’t happening anytime soon, no matter what the Bulls or another team offers. With McDermott and Mirotic both acquired this offseason, the CBA puts restrictions on when they can be traded. The signing of McDermott (and Wiggins, for that matter) was just officially announced, triggering a 30-day waiting period during which he cannot be traded. Although Mirotic is not subject to the rookie scale contract, he also must endure the same 30-day wait. With so many rumored destinations, it makes sense for the T-Wolves to sit tight and let these deadlines pass, giving them as much leverage as possible. That being said, my initial reaction is that trading for Love would be too costly based on the other offers out there, and in turn would strip the depth chart of valuable rotation players. It sounds like to trump the Cavs, the Bulls have to be comfortable parting with at the very least Gibson, Mirotic, and McDermott, with possibly more assets included. Between Gibsons’s defense and Mirotic’s shooting ability, their combined skill sets might be more valuable to the Chicago frontcourt on both sides of the ball. In such an active defensive system, Thibodeau would really benefit from being able to use ten or eleven guys in the playoffs, and Chicago addressed its offensive issues without compromising its identity. At the very least, I think you have to give this group a chance to start the season, and if Love is still around closer to the deadline after a tough start, consider making the move. But if the Finals taught us anything, it’s that while Big Threes grab headlines, they don’t always win. Sometimes a combination of depth, passing, tough defense, and stellar coaching works just fine.